Some students can take a foundation degree after they have finished college or sixth form. However, one really important thing to consider is that there are no set entry requirements to foundation courses that everyone follows – so people who are experienced in a particular job might be allowed to take the course based on their experience and sometimes people who have completed other training can use it as part of their studies. Sometimes businesses ask their employees to take foundation courses so they can improve their skills whilst still working. Foundation degrees usually take two years if studying full time. Because lots of people take foundation degrees whilst they are working though they often take longer to study part time. Foundation degrees are perfect for people who want to learn a set of skills which relate to a specific job or career. They take less time than a full undergraduate degree (they are equivalent to about two thirds of one) and will give you a really good understanding of your role in the workplace. Students who take a foundation degree tend to enjoy learning whilst doing, and applying their knowledge straight away, but there are still some academic elements. Some students taking foundation degrees choose to ‘top up’ by completing a further year of study and getting an undergraduate degree. However, because foundation degrees are designed to give you a set of skills which relate to a specific job or career most people’s first choice is to go on to work in that job. Even though they are very career focused, foundation degrees are still recognised qualifications, so you could go on to most other higher qualifications (usually by first completing an undergraduate degree) without any issues. 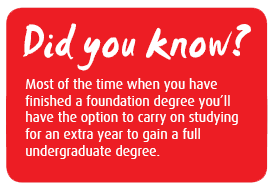 Most foundation degrees are designed and taught by companies, so you can work whilst earning your qualification. 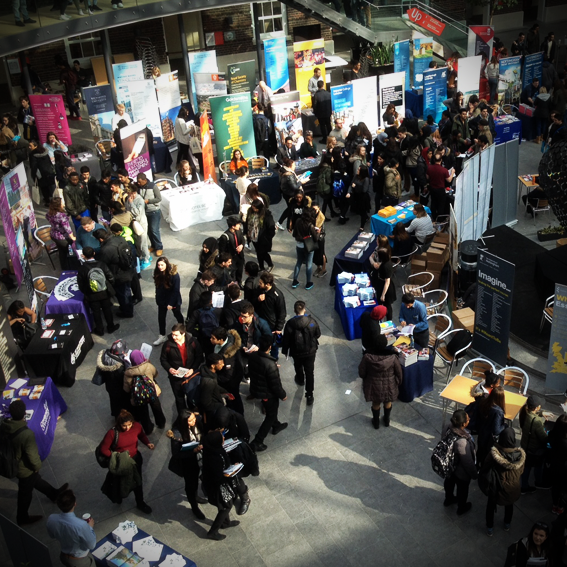 Some of these companies do work with universities or colleges for the academic parts of your studies as well, so you’d either be working all of the time with a company, or part time with a company and part time in a university or college. Foundation degrees cost different amounts depending on where you study. The good news is that students studying foundation degrees are eligible for student finance. Some of the businesses that provide foundation degrees also provide financial support for students who are working with them, or will go on to work with them when they finish. The qualifications grid shows some of the most common qualifications in the UK, and their levels. There are 8 levels of study in the UK, remember these don't relate to how long qualifications take, but they are used to show how qualifications compare with each other. 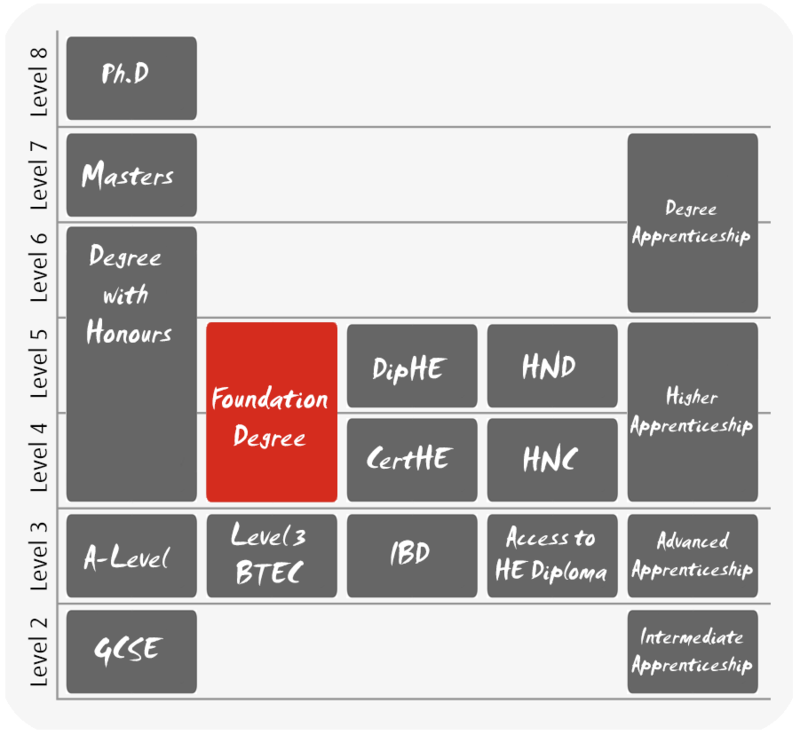 Use the grid to find out what level Foundation degrees are in comparison with other qualifications. How you apply for a foundation degree depends on whether you’d be studying full or part time. Part time courses require you to apply directly to the university or business that offers them, whilst you’d apply for a full time course through UCAS. 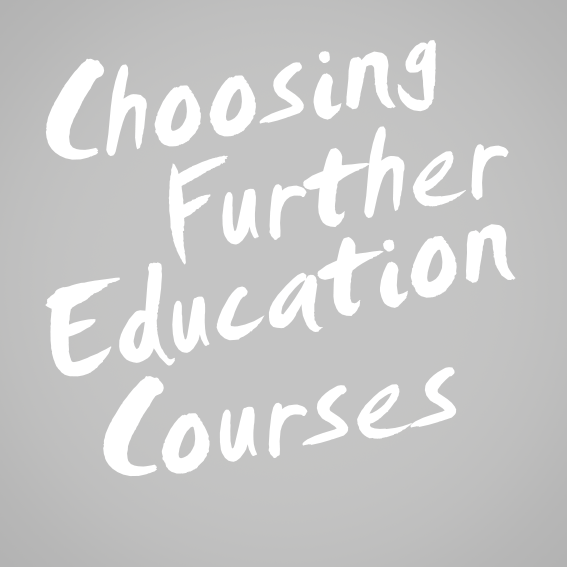 Foundation degree courses appear alongside all the other courses on the UCAS website. You can use the course search page and filter your results by ‘HND, DipHE or Foundation Degree’ on the left hand side bar. Prospects has some great advice around where people who have completed a foundation degree go on to work.